This innovation will further unlock the potential of LED integration into surfaces and adds an exciting dimension to interior design and space planning. The solution will transform the way people interact with information and their environment in offices, hotels, conference centers and other public buildings. The solution is designed for high traffic areas and comes in different colors, shapes and sizes – enabling highly flexible application of the new technology. “This light transmissive carpet solution is designed to engage directly with people’s senses and the eyes’ natural inclination to seek out light. The technology takes advantage of people’s tendency to be guided by the floor when moving through and interacting with space. It brings information, direction, inspiration and safety via the carpet you walk on. This partnership of market leaders is focused on bringing meaningful innovations to the market.” said Ed Huibers, Marketing and Sales Director, at Philips Lighting. The partnership is an agreement to work exclusively together in developing the markets in EMEA. In addition to this, a joint development agreement has been signed focusing on a seamless integration of this solution into new and existing buildings. September 24, 2018 - Global Commercial Carpet Market 2018-2022| Rising Non-residential Buildings Construction Drives Growth| Technavio Business WireTechnavio's global commercial carpet market research report forecasts the market to register a CAGR of almost 3% during the period 2018-2022. November 22, 2013 - LEDs become part of the building fabric with "Light Transmissive Carpets" TreehuggerThis is the future of lighting design, where the LEDs become permanent parts of the buildings, not something that is just plugged in. 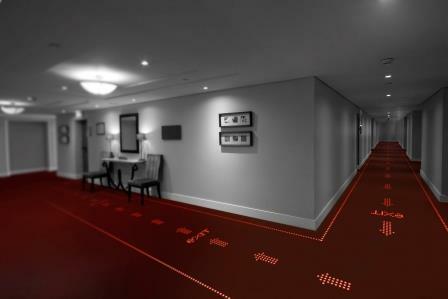 January 29, 2019 - Lighted LED Carpet May Light the Way to the Future - Or the Bathroom Small Business TrendsCan't find your way to the bathroom in your new office complex? No worries. Lighted LED carpet will do it for you -- light emitting carpet; yes, it's true.